“Welcome people of the Internet! This is what the inside of the Internet looks like. . . ” Feist said pointing at the stage and band surrounding her. Feist knows the truth: there are no secrets on the Internet. 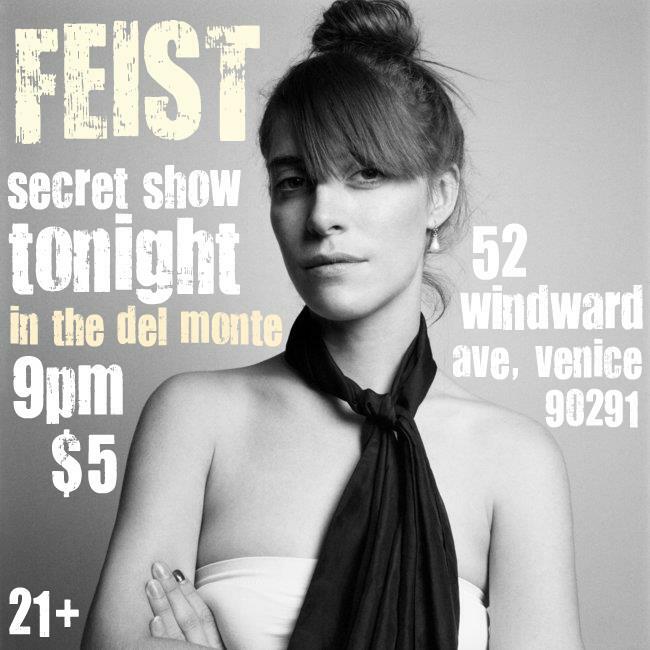 As tweets about last night’s “secret show” at The Del Monte Townhouse in Venice began to circulate in the late afternoon, Feist initiated her own tweet: “Anyone in Los Angeles will probably have a good time tonight if they can find this place by 10pm…”, along with a picture of the venue. Feist debuted songs from her new album, Metals (available October 4, 2011) at the small venue which served as an illegal speakeasy during the Prohibition. It doesn’t take long for word to get out on Twitter and by 9:45pm the room was packed, the venue and upstairs bar were at capacity, and a line of fans hoping to get in extended beyond sight. When you see Feist, you know she’s doing exactly what she’s meant to be doing. Everyone who was at this show (celebrities included) was a huge fan of Feist. Many people inside the venue and even more people outside the venue were alerted about the show merely hours beforehand. They cancelled plans, they drove across town, they sat in traffic on a holiday weekend, waited for hours in line or at the bar. Moreover, they’d waited years to see Feist play again. Inside the venue it was hot. Not just temperature hot, stuffy hot. If you were standing beyond 10 rows deep or were under 5’10”, chances are you couldn’t see. The sound of the DJ upstairs interfered at times with the sound of Feist. There were a lot of elements to overcome. What impressed me the most, in addition to the music of course, was Feist’s ability to unify the audience. Feist literally took the hot, uncomfortable audience on a journey to a place where they forgot about everything but the music. It was done with intention. You could feel it. She kicked off the set with “A Commotion.” It made a statement that imbibed: “Yes, it’s true. I’m here. You’re here. This is music. Let’s go.” Upon bringing the audience to a place of complete presence, she moved into some more “mellow” songs, joking, “It’s this new punk rock concept called a ballad.” People settled in, the talking in the back of the room began to fade away, we were on our way to another destination. By the time Feist brought us to “Woe Be,” which offers words of wisdom and caution, with an edge of humor, about people who fall in love with songwriters, we arrived somewhere else. “We’ve gone through the vortex and entered another dimension. You can feel it,” Feist exclaimed joyously. The crowd cheered in unison and agreement. “Sea Lion Woman” set off a dance party that carried us through the remainder of the set. Female folk trio, Mountain Man, harmonized and played a variety of instruments that added greater depth of atmosphere and playfulness to the set. They, along with Feist and the entire band, provided the fuel that carried us through the vortex and back. By the time the show ended, “Feist” was a trending topic on Twitter in LA. Fitting, given her intro, and the fans’ entrance, to the show. This entry was posted in Secretish Show, Townhouse and tagged del monte townhouse, Feist, live music, Metals, music, New album, Secret show, single, townhouse, Venice.